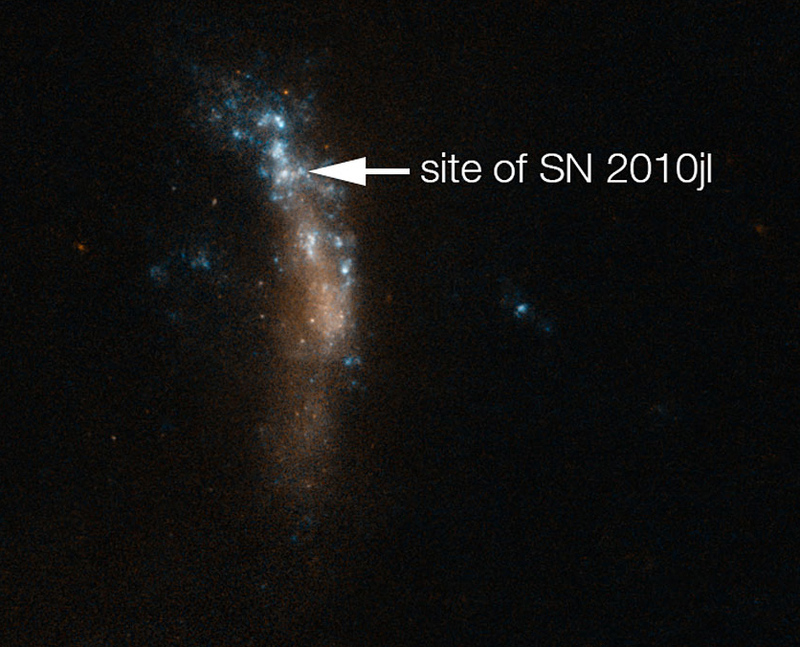 Supernova SN 2010jl exploded 150 million years ago, sending light carrying clues to the formation of cosmic dust, the building blocks of planets. Dust: It’s the bane of astronomers — since it blocks many wavelengths of light, dimming our view of the universe. But it’s also the source of planets. And that helps explain the excitement about the discovery of masses of dust created within months after a supernova was detected in 2010. By “dust,” astronomers mean tiny grains of various elements that have condensed to a stable condition. Dust may form vast clouds in solar nebulae, and eventually contract into stars and planets. As expected, they saw plenty of dust, and, less expectedly, a two-step process, with tiny grains (diameter: about one millionth of a meter) followed by larger grains (about 4.5 microns) in an observation made 30 months after the explosion. 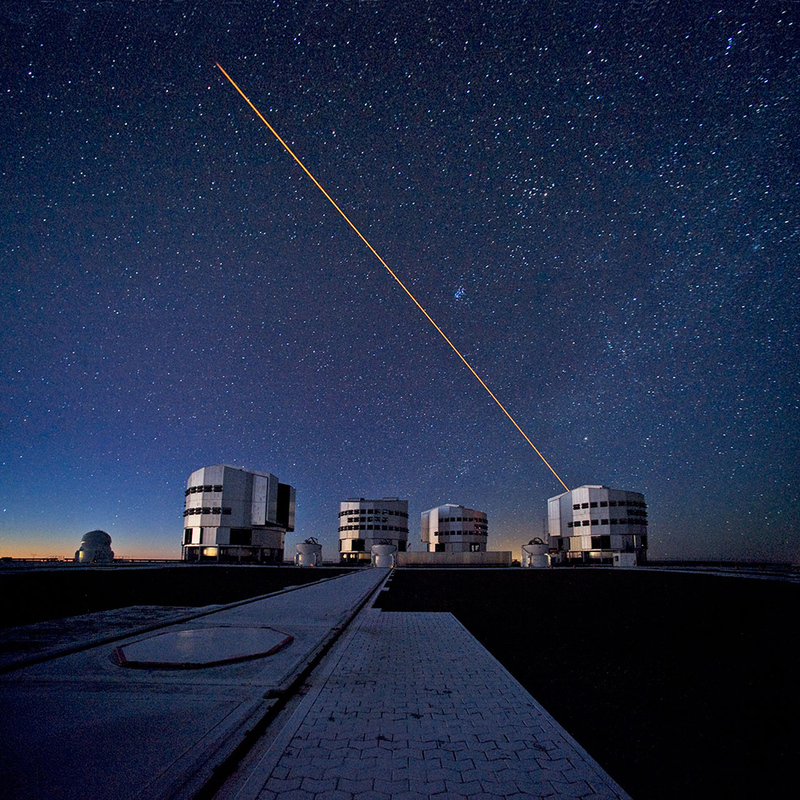 The four 8.2-metre unit telescopes at the ESO Very Large Telescope during an observation. That laser beam creates an artificial star at an altitude of 90 kilometers, helping adaptive optics erase the effects of atmospheric turbulence. The result is images that almost as sharp as if they were made in space. Life: In dust we trust! Carbon is the most common element in cosmic dust, which also contains silicon, oxygen, iron, magnesium and other elements, Gall says. In the early phase, at least, hydrogen and helium are rare, even though they are the most common elements in the universe. 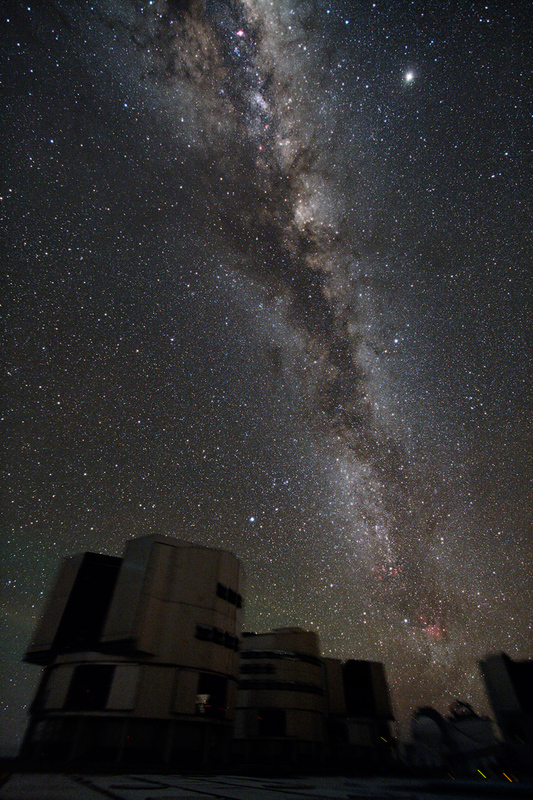 The ESO Very Large Telescope seen against the backdrop of our galaxy, the Milky Way. The telescope, billed as the best visible light observatory in the world, is situated in the dark, high and dry Atacama Desert, Chile. Clouds of dust explain those dark blotches in the Milky Way. The star that exploded, called the progenitor, was apparently quite hefty, 40 or 50 times the mass of our sun, and thus contained the energy to make a titanic explosion that sent photons hurtling all the way to the observatory in Northern Chile. Gall gives an educated guess: Before the explosion, the progenitor star shed its outer shell. Then the exploding supernova sent out a huge shock wave that collided with the erupted shell. After the shock wave passed, a dense, cool region was left. Dust is also distributed when low-mass stars like the sun die, Gall told us. It cannot form from cold gas in interstellar space. Planets: we lust for dust! Once stable dust grains exist, elements can gather on their surface, enlarging the grains into the ones seen by Gall’s crew in the later observations. And those larger grains are thought to be more resistant to destruction in the high-energy environment surrounding the supernova. The Milky Way contains a mass of dust equal to 10 million suns, and dusty galaxies may have ten times more. So next time you dust the furniture, remember that we now have a better idea of the birthplace of cosmic dust.